Lyle: Make sure you are muting the big 6th string with either the tip of your 3rd finger or the tip of your thumb. Lyle: You can loop the TAB notation to help you play along or try using the looping jam track. 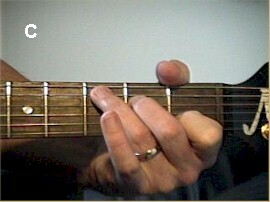 Notice that your strumming arm is going at exactly the same speed as in rhythm 1. The only thing different is you're choosing to hit the strings on the way up after beat 4. It sounds like you're going faster but you're not. Lyle: I know you're tapping your foot and counting out loud.....Keep your foot going down on all 4 of the "down beats", the 1, 2, 3, and 4 beats of the measure. Lyle: Are we doing ok out there? zack: I get the rhythm, but I'm having a hard time with the up strokes? Lyle: When you watch the video clips you'll notice my strumming arm never changes speed, it just sounds like it because of the added up strums. One of the secrets to being a smooth sounding guitar player is being able to master these simple rhythms. Lyle: Rhythm 4 is a popular rhythm that is used in many style of music. Remember you can loop the TAB notation to help you play along. You can even SLOW it down! Lyle: It's not real important you hit all the strings of the chord, as long as you are keeping the beat. You'll learn to smooth out the strum. Watch my video clip examples, you see how my arm stays at the same speed/pace through all these rhythms. Lyle: No, it's not a waltz beat, it's more of a country rhythm. A waltz beat has only 3 beats per measure, this has 4 beats per measure. Lyle: Remember you can loop the TAB notation and even slow it down to help you play the exercise along with me. Lyle: You really have to concentrate hard to be able to 1. memorize each rhythm and what comes next, 2. keep tapping your foot and counting out loud while perfecting your smooth strum. Lyle: That's all for now, thank you and see you in the next lesson as we work on more rhythms!